There are a vast amount of product comparison sites on the web and a number of social shopping sites that allow online shoppers use their social graph to share purchasing decisions. Today video search engine Blinkx is trying to combine the two functionalities with the launch of Cheep, a social shopping service. Through a browser add-on (which currently only works on Firefox or IE), Cheep recognizes when you’re looking at a specific product and will show you current price comparisons from around the Web, as well as reviews and ratings. 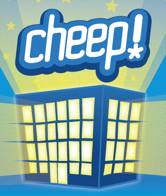 Cheep will appear as a small bar at the top of your screen when you’re looking at a product page. The startup has indexed millions of products nearly 200 online retailers, including Amazon, BestBuy and Walmart, so chances are that Cheep will be able to find the product you are viewing within your browser. Beyond the add-on, Cheep is also a standalone social network that encourages users to share their shopping activity, including purchases, wishlists, likes, reviews and more; with other Cheep members. The startup is also creating profiles for millions of products, which users can share on Facebook and Twitter. I doubt I’d really use the online community side of Cheep but the browser add-on could be useful. The ability to receive automatic, contextual information such as alternative reviews or prices for a product without having open another browser tab for a search is appealing.